The WiFi Pound Nine News Wire Sits Quietly On Your Desk And Delivers The News You Want In Real-time, Enabling Busy Professionals to Stay Informed While Staying On Task. 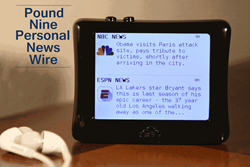 Stream Live News Updates on Your Personal Wire! People who have an unquenched thirst for staying up to date with the latest news and happenings will find relief with the launch of the upcoming Pound Nine News Wire, a wireless real-time news wire that continually streams news headlines from the user’s chosen content sources. The Pound Nine technology project is currently in need of funding to cover the tooling, sourcing, and manufacturing expenses required to produce this innovative electronics device. This new consumer electronics product has been designed to be a leading edge way of pushing user selected content straight to the user through a simple device no larger than the palm of the hand. It has been designed to be more convenient than taking a phone out to check news feeds and to be less distracting than having many browser tabs open to read news from different sources. The Pound Nine News Wire is designed to sit on a desk or table top, and continually stream live headlines from an aggregation of data sources the users select. Users will be able to configure and select content sources they want to be delivered from the Pound Nine content menu that will feature different categories including headline news, networking websites, stock market, sports, tech, business and user defined compatible RSS feeds. As a knowledge thirsty person himself, Brad set out to develop the Pound Nine device to be a convenient solution for enabling users to stay informed while they are busy keeping up with other tasks, in a manner that is convenient and not distracting. The device has been developed to be easy to install and requires a few simple steps to be up and running, even for people who do not consider themselves to be tech savvy. The Pound Nine Wire will feature a complimentary mobile app that will assist the device to access Wi-Fi and provide a content notification feature. Complete step by step installation instructions will be provided with each device for the convenience of users. The Kickstarter campaign, with a $40,000 funding goal, is looking towards the generosity of the online crowd who are information seekers and like to stay up to date with information that directly affects their productivity. The funds raised through the current crowdfunding campaign will be allocated to various aspects necessary for the completion of the product for customer use. Brad and his team will be offering a variety of rewards and perks to appreciate the generosity of those who support the campaign and the project through their monetary contribution. easy-to-use internet enabled devices that provide real time access to information.